On Bright Monday, the feast of St. George, the faithful in the village of Kambi in Farmaka saw an icon of St. George gush myrrh. The next morning bells in the village struck from 6:00 AM. 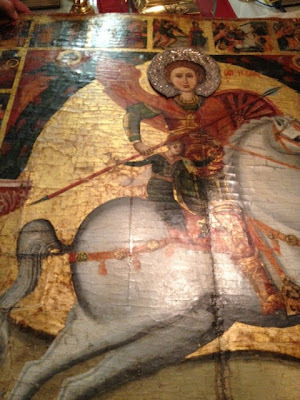 The icon was painted in 1624, is of unique iconographic value, and depicts St. George riding on a white horse rescuing a child; it is in the village church which bears his name. In fact yesterday the church conducted services all day long for the faithful to honor St. George. According to Metropolitan Isaiah of Tamassos, this began when the icon was too heavy to be carried in the procession and it took six men with great effort to lift it. This is something that has never occurred before. His Eminence himself testified to the fact that when he arrived at the church that day, he was able to lift the icon by himself. After the procession, as they were praying, one of the faithful at around 10:00 AM testified that from the tunic of the Saint there gushed forth a thick liquid that was fragrant and mixed with the varnish of the icon, which was done 12 years ago. Everybody saw this and they were very moved and began to pray more fervently. Yesterday the Metropolitan rushed to the church together with scientific experts to examine the icon, who apparently could not find a natural explanation or cause for the phenomenon. The Metropolitan said after: "Today I celebrated the Liturgy and I thanked the Risen Jesus, who allowed His Saint to bring us the message of the Resurrection and filling the lives of the faithful with hope amid the multitude of our sufferings." The village of Kambi in Farmaka is historic, located in the eparchy of Nicosia in Pistilia. According to the 2001 census there were 104 residents.